I have my friend Sarah (formerly of A Library is the Hospital for the Mind) to thank for introducing me to author D.E. Stevenson. It had been a year (almost exactly!) since I read my last book by Stevenson and so my hands were practically (just about literally) itching to read another. I ordered The Young Clementina because I just wanted to relax with a book and I figured Stevenson was a good bet. It was time to give in and indulge myself! My expectations for a good time were met, although I was surprised by the content. Really I can't think of any marvelously good reason to put forward as an explanation as to why I enjoyed The Young Clementina as much as I did. Written in 1934 this book has been previously published under two different titles: Miss Dean's Dilemma and Divorced from Reality. 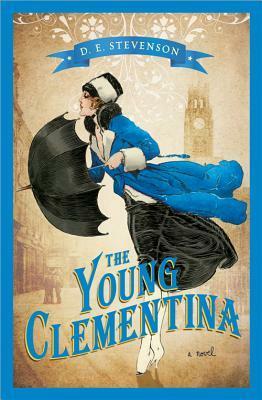 It was republished under the title The Young Clementina in 1966. (Personally I think the title Miss Dean's Dilemma suits it best but I would enjoy it under any title.) One person has written that readers like Stevenson books because the characters are endearing, they encounter familiar circumstances to us, and that Stevenson is just simply a terrifically good story-teller. I agree with all of that. It's the only thing that makes sense. This book covers a rather wide time span. We meet the protagonist, Charlotte Dean, who is writing down her remembrances from her childhood. We track with her relationships with other key characters from childhood well into adulthood. She is writing down her past history because she has a problem which she needs to solve in the present and she hopes that by writing things out, it will bring clarity of mind and help her think through the issues at hand. You aren't immediately told why the past is relevant and you have no idea what the current problem is that is facing her. Patience is required as a reader. Stevenson will fill you in, but she is going to ask that you wait with her while she slowly tells you Charlotte's story. By page two I was fully engaged, wondering what great mystery was wrapped up in this book. As much as I enjoyed this read, I also hated it. The Young Clementina is quite depressing. Charlotte experiences some great losses which leave the reader feeling both helpless and angry throughout the book. You want reach into the pages and shake sense into characters, holler at them, speak up for others when it doesn't seem like they can do so on their own. All the reader is allowed to do is watch and wait in total agony. Why couldn't I stop reading when I found it to be so frustrating and hopeless? I can only refer you to the suggestion of others that Stevenson tells a good story. As much as I wanted to turn away and forget about it, I could not. It had to be read to the bitter end. There is talk of a marital affair and infidelity. There is foul language scattered liberally throughout the book. God's name is taken in vain. Repeatedly. Can you see why I'm confused as to why on earth I would like this title? Normally all of the above would be a complete turn-off to me but in this case I was spell-bound. I don't know if it was the time period (post World War I through the Great Depression), the setting (England), the characters (completely believable), or the faith in God expressed through the bitter hard times which made this book so attractive to me. It is probably a combination of all of the above. I understood the time period and the characters better after, well, watching the last season of Downton Abbey and then reading this book (which I find hard to recommend). Charlotte's way of thinking was more understandable after exposing myself to these other things. Also too, Charlotte could be likened to the main character's voice in Du Maurier's Rebecca, a character I cannot stand (because my personality is total opposite). Charlotte, however, grows a spine which made me both forgive - and ultimately love - her for her personality. Really and truly, what it boils down to is that this is not a book I would normally enjoy. When I began reading it I hesitated a little, wondering if I should press on. However, a few chapters in and I knew that the only way out was through the entire story and so I committed myself to it. Ultimately, I have to confess that this is going to be one of those memorable stories that just stand out in my mind as being peculiarly stellar. It's sort of like Gone With the Wind. Why does anyone like that book? Why do I like it? I don't know. I just do. I'm really glad to have read The Young Clementina and instead of putting me off Stevenson it only increased my appetite for her works. I'm striving not to give in to temptation and order every single book of hers which I've not yet previously read. Amazon is just too convenient sometimes! If you want to try a Stevenson I highly recommend starting with Miss Buncle's Book which was great fun. I've lived the title to my review of the same. Thank you, Sarah, for "pushing" Stevenson on me. I am indebted. It sounds interesting, the kind of book I enjoy, except for the warnings you gave. Foul language? God's name taken in vain? How does that reconcile with "the faith in God expressed through the bitter hard times which made this book so attractive to me." Also, I'm surprised that a book written in 1934 would contain the above. Thanks for the review. I had not heard of D. E. Stevenson. @FancyHorse - I did NOT explain that very well. Not very well at all. The short answer is that the character of Charlotte is a pastor's daughter who has a deep faith in God. She goes through some very hard, bitter times but never loses her faith. She's actually quite admirable (and it isnot her that is doing the cussing). However, there is another character who is wronged and that's where most of the cussing comes from. You definitely see a contrast between the submission to life's circumstances and a trust in God and the frustrations that we feel as human. I don't like to read bad words because I don't want to fill my mind with them. At the same time, sometimes life circumstances make me want to cuss and sometimes I actually DO cuss. Because life is hard and we experience brokenness. Does this make it right? Well...no. But does it make me human? Yes. And I will and do submit to what God has called me to. That doesn't, however, always make me happy. So I can sympathize with someone who is cussing in frustration and understand there are sometimes really good reasons for it (and there were mighty good reasons). It was teh contrast that struck me between the cursing and the humility. I just finished reading Go Set a Watchman, and your comment has left me pondering even more. They tie in quite nicely(even if I didn't care for the book at all). I grabbed the first two books in this series when they went on sale, and you've reminded me how much I want to read those two. Hmm, I'm going to have to go back and re-read this because I don't remember the foul language. Obviously, I blocked it out. I read this last year and thoroughly enjoyed it. I am currently reading Celia's House right now by Stevenson and so far so good. I love D.E. Stevenson books but I have not read this one. Thanks for the warnings although foul language etc. is not the norm for her books. I love the Miss Buncle series and "Listening Valley" which was recently reprinted. If the series with Vittoria Cottage, Music of the Hills and Shoulder the Sky are ever reprinted, they are worth reading. I shared many of the same thoughts you had with The Young Clementina, so I don't have anything to add re: this book. I will say that I liked it a lot better than "Rochester's Wife" and "Smouldering Fire". But thankfully, D. E. Stevenson wrote plenty of good stories, so you've got many more to enjoy. I'm thrilled they're finally being republished.